The Greek mythical figure and king of Ithaca (one of the Ionian Islands ) was the most lucrative hero of the Trojan War (founder of the "Trojan Horse"). In the epic "Odyssey" of the poet Homer (8th century BC) is told after the victory over Troy his adventurous journey home. Odysseus had wine from his home island and out Thrace (at that time the entire Balkan Peninsula - today divided between the three countries Bulgaria. Greece and Turkey ) taken. The second was a honey-sweet red wine so rich in alcohol that it was supposed to be diluted with 20 parts of water. One of the stations on Odysseus' wanderings was the land of the Cyclopes, which was isolated by several ancient authors in various parts of Sicily. Here Homer, with 12 of his companions, was captured by the one-eyed giant Polyphemus, who imprisoned them in a cave and gradually consumed six of them. 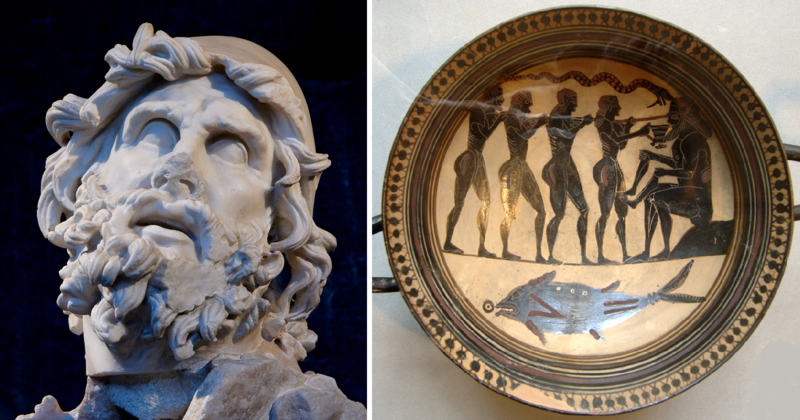 Odysseus offered him the Thracian wine as a digestive drink. The effect on the giant was overwhelming in the true sense of the word after being consumed, for he fell asleep. Then Odysseus and his companions rammed a glowing stake into the only eye (right). The following morning, the prisoners escaped to their ship. Polyphem threw a rock at the ship, but missed the target. This is still today, half submerged, off the east coast Sicily to see near the volcano Etna. This page was last modified at 13 October 2017 at 11:41.